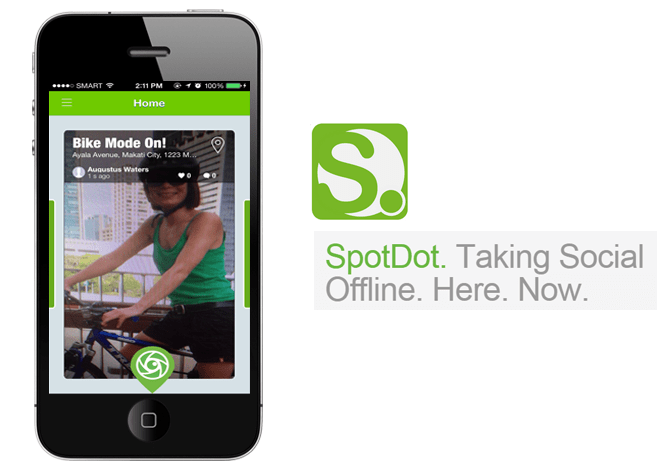 Spotdot is taking Social Networking Offline. Go Out Now! Social media is a curious contradiction. It lets you connect with people old and new, find interesting places, learn new things but then it also puts your privacy under the spotlight, overwhelms you with mundane nothings and makes you wary of people because most of them are creeps! And while you fret trying to manage your online presence, your offline life takes a backseat. “Go Out More” is on everyone’s sticky note stuck to the fridge and Spotdot is making the transition easier – using online technologies to enhance your offline activities. Spotdot is a Made in Brisbane, Australia product. Lucio Piccoli and Dave Crane, the founders of Spotdot, unabashedly describe themselves as tech geeks – Lucio is a programmer (“Cutting code for far too long”) while Dave is a radio engineer (“Dissecting mobile phones every day“). They are helped by a small team of developers working on both the back end and phone apps. They started working on the app out of a spare room in Lucio’s house. “It is difficult getting good tech people in Brisbane”, says Lucio and confesses that dealing with the trepidations of an entrepreneurial venture – of not finding backers, of being told “It won’t work”, of going broke – is their biggest challenge that also keeps things exciting! Location based apps like Tinder hooks you up with strangers, Foursquare does that with places, and every other social network makes you stay glued to a screen! Spotdot is designed to get people off Facebook and twitter and meet up with friends in the real world, over real activities. It takes advantage of being both location and “friend” aware but not being intrusive in its data collection – you are in control. When you feel like letting your nearby friends (Spotdot imports them from your Facebook account) know about the activity you are currently doing, just take a photo with the app and it’ll do the rest. The sophisticated back end wizardry at Spotdot figures out the relative proximity (you can set the search radius) of your friends and only notifies those who are nearby. “The only competitor that has similar tech is ‘Swarm’ by Foursquare”, says Lucio but he is convinced that Spotdot has the upper hand when it comes to allowing a more spontaneous connection between people. When Foursquare spun out Swarm, it tried to separate finding great places from knowing where your friends are. But Swarm still feels like a friend finder service. “A great feature of Spotdot is when you move away from your location, the posted ‘spot’ gets expired and is removed. So we are only keeping the ‘here’ and the ‘now’.” So imagine you are at the beach and you post a ‘spot’ – just a simple geo-tagged photo – on the Spotdot app. One of your friends happens to be in the vicinity and gets a notification about your spot and both of you have a spontaneous, real world face time. Now that is way better than likes, retweets, and check-ins! Spotdot is currently launching in the UCLA Campus, targeting the “never settle” age group of 15-28 and plans to go global. The app is free (for both iOS and Android) and has premium channels where people can follow a brand and the app will notify, for example, if there is a new outlet or a limited offer when they are in the vicinity. Shop, Sell, Repeat at Totspot! Change Your Life, Meditate With ZenFriend! Next articleOrganize Your Evernote Notes With Kanbanote! Papermine: Build Digital Booklets To Zing Your Contents!